On their own, they’re already towering figures in folk music. Together — whew baby. 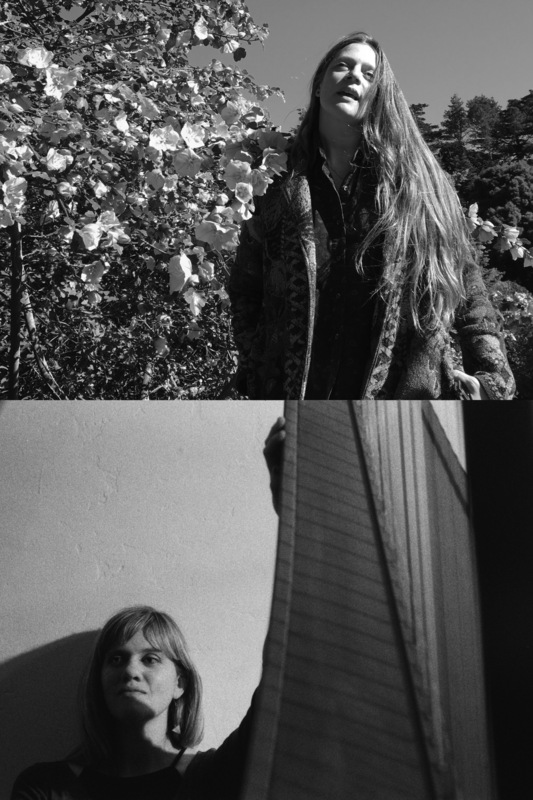 If you're familiar with Meg Baird or Mary Lattimore, as any self-respecting listener of American folk and psych-adjacent music over the past decade surely is, you can guess how monumental their first collaborative album will be. Called Ghost Forests, it's out this Friday on the timeless Three Lobed Recordings. Baird's guitar and voice and Lattimore's harp are just meant to go together. They're both veterans of the same Philadelphia scene that gave rise to Jack Rose, Steve Gunn, and Kurt Vile (they recently toured Europe with Vile, who told me Baird is one of the "purest folk artists"), but they only wrote these songs once moving, separately, to California. The expansive, textured minimalism of "Between Two Worlds" gives rise to vocal tracks like "Damaged Sunset" and "Painter of Tygers" that are simply — and this word is a cliché everywhere except for here, where it is right — ethereal. Fans of Dear Companion and At the Dam will be especially blown away by "Fair Annie," a traditional that is the album's most familiar-sounding song but somehow also its most magical. We spoke over email about the collaborative album, which is debuting in full today on The FADER. How has the tour with Kurt Vile been going? Your lives have all gone in different directions since the old Philly days, so i imagine it's pretty sweet reuniting. MEG: The music has been great out on tour. The main thing that has changed is really just the scale and complexity of the stage logistics for Kurt and the Violators. But otherwise it feels really familiar. For me, especially being around Jesse Trbovich and Kurt together. My first shows with Kurt were as that duo with Jesse, and we all crammed in an econo rental car up and down the West Coast. Even then, I remember how focused both of them were on the shows and what they were trying to present. We wound up chasing down a bunch of crazy Office Depots and Guitar Centers in Humboldt County and small Oregon towns to make sure to get these special sample tapes that seemed so key to what they were trying to present. MARY: It's definitely sweet to reunite and to reflect on where life has taken us all. Tour has been really fun so far and feels cozy, although our van and his bus are on pretty different schedules. I played on his recent record, which was partly recorded in L.A. where I live, so it's been cool to see Kurt fairly regularly through that process. I think he's a person with whom I'll always feel connected to no matter the distance. How has it been to play the new album live, as opposed to what i imagine was a pretty intimate and focused recording/writing? MEG: It's been pretty thrilling and on-the-fly on stage for me, especially since playing electric outside the living room is so new to me. The excitement of discovery, of “what is going to happen next” that we had in the studio seems really present in the live performance as well. MARY: It was focused but also felt like there was a ton of creative freedom when recording. Playing the songs now before the record's out is fun because we're testing the songs out, rationing out the timing with our 30-minute opening set, feeling it all out. It's in the experimental stage now where we are not bored of the songs at all yet, where they're fresh and there's still room for happy accidents and new ways of translating them live. I guess I wish I had an extra hand to play more synth parts, but am trying to make it sound full with layers of harp. Why do you think it took being in California for you two to make an album together? MEG: It may have just giving more urgency to wanting to make sure to try it. Very much less of a "we can do this anytime" feeling than we would have had in Philadelphia. It also gave us great common subject matter. Cory Rayborn's offer to release our (totally unheard and at that time non-existent) collaboration was what really made this happen. We felt the entire 2018 calendar slipping away from us and grabbed a window in early January to try and make sure we made something. MARY: We were both so busy in Philly with jobs and other bands and the moment seemed right at this point. I don't think it was the geography/city as much as logistics and time opening up a little last winter. Three Lobed is a fitting home for this record, sonically. Did you know it was going to be for that label when you started, and it encouraged you to be more drone-y and psychedelic? MEG: We absolutely made this record with Three Lobed in mind, and with Cory’s generous support and cheerleading. The drones and heavier textures were what we wanted to do for certain together, regardless of the record label, but working with Cory gave us total freedom to not worry about any expectations but our own. MARY: Cory has been a great supporter for a long time. We have both played his Hopscotch Festival day parties, and I worked on the Steve Gunn/Kurt split for his Parallelograms record series. I think Meg and I both love psych-y, droney music and a song like "Between Two Worlds" doesn't seem that far from other stuff we've worked on to me, but maybe different from a song like "Fair Annie." Makes me happy to have a broad palette and to be able to just do whatever we want, no rules! Meg, I think "Fair Annie" is the first traditional that you've released in a while. Was there something about working w/ mary that made you want to do that again, or just a shared love of the song, or…? MEG: I thought that Mary could really add an incredible dimension to an arrangement of "Fair Annie." It's really dodgy and messy territory creating more produced and contemporary renditions of traditional music, and I knew Mary would totally get it. We also started this arrangement for the 7-inches for Planned Parenthood project, but all the verses, the whole story wouldn't fit onto a 7-inch! Also, I love singing the “Queen Mary is my sister” line. The “Queen Mary” figure shows up in quite a few songs, but this seems like an especially good reference. That ballad is very much about being kind and doing the right thing, and I love all of the layers we can bring to it.